Accommodation is usually the biggest concern for people who are planning a trip.Figuring out where to stay and then trying to find the best price can take hours. Here are my tips for finding the best-priced holiday accommodations quickly. Hotels pay a commission to the hotel booking sites. Call the hotel directly and ask them what the best rate they can give you for accommodation will be if you book through them directly. The main goal of a hotel is to fill their rooms, so they usually will be more than happy to offer you a discount. I ask for discounts on everything even with the owners of rooms or houses on Airbnb. Not only do hostels and guesthouses charge a lot less than regular hotels, I find that I usually meet more people in them. Hostels are no longer just for young backpackers. You will now find people of all ages staying in them and most of them offer private rooms and bathrooms. My favorite hotel site for searching them is HostelBookers.com. Not only do they offer the best prices, but they have listings for hotels, guesthouses, apartments, campsites, and regular hotels. The reviews for the places are right on the site, and you can view the places listed by either private rooms or shared rooms. I find this site is a huge time-saver when I am looking for accommodation. If you are a digital nomad like me, the biggest discount in the world won’t be worth it if the Wi-Fi isn’t working. Thank goodness for HotelChatter’s hotel Wi-Fi report. They put out a report each year of the hotels with the best and worst Wi-Fi. This is great guidance when selecting a good accommodation to stay at. You will get lower rates, and the hotels will be more prone to bargaining if you go in the off-season. Plus, you will be more likely to have that perfect paradise beach all to yourselves. I think that not planning anything can be the best time and money saver of all. Of course, you don’t want to do this during busy season or during a holiday. But, you can really only decide if the accommodation is in the best place and the quality of the rooms by seeing them for yourself. Also, you can be a more spontaneous traveler this way. Hotels and guesthouses are also much more apt to give you the best price last-minute when they fear the room will not be booked. Yes, sometimes being a slacker really can pay off! Sometimes, I will also wait until the night before I am arriving, and I will book on Agoda. They also have great last-minute deals on their website. House sitting is a great way to see the world without paying anything for your accommodation. I recommend Trusted House Sitters site as a way to find house sits in the areas that you want to go. They are the largest house sitting network and have the best choice of house sits out there. Do you have any recommendations for finding accommodation at good prices? Leave a comment below!! These are all great tips! I will keep these in mind when planning our next trip. Thank you for sharing. Thanks for the great tips, never knew about the Wifi Chatter site, will definitely have to check that out. Yeah, it’s an annual report that they do, but all of the advice that they give on their site is very helpful! I love the slacker move, haha! Merci pour les petits astuces (mais qui s’avère être important je crois). Moi qui ai l’habitude de comparer à gauche et à droite les offres, pour mon prochain voyage, je vais essayer de m’abstenir à tes conseils pour voir si c’est vraiment efficace. All great tips – Checking sites like Groupon might reveal some deals as well for those people wanting to book ahead. Awesome tips! I’ve never heard of HotelChatter either. On top of hostels and guesthouses, I would also add alternative accommodation options. Vacation rentals (like AirBnB), house-sitting and home exchange can all be great options, especially for longer stays. I think these are all wonderful tips. Really helpful. Thanks. You are absolutely right about the hotels. Ask them! They will usually find a lower rate if you ask. I myself have never paid the full rate for anywhere. Then again, maybe I’m just lucky. All excellent tips Val! I find hotels will often give you a discount if you contact them directly. They pay high commissions to booking sites like Expedia, so they’re willing to provide a discount and still come out better in the end if you book directly with them. Very true, Jennifer. Thanks for the advice! 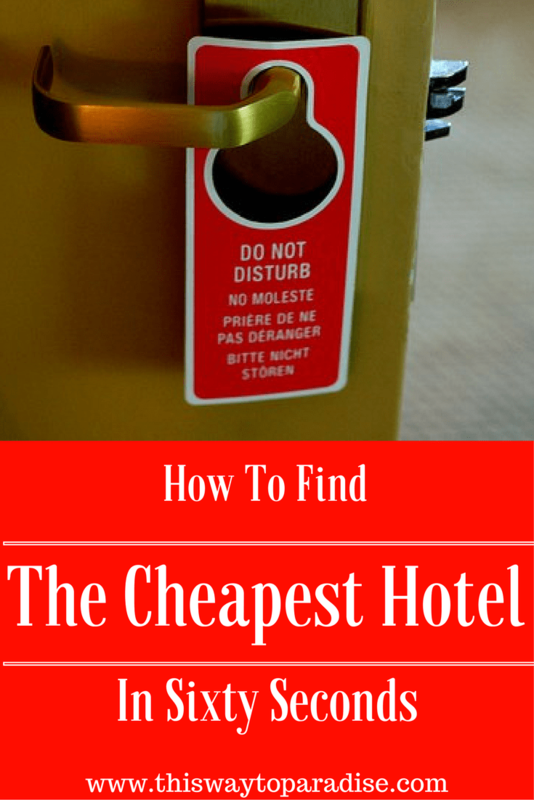 Wonderful tips to find a hotel . I like all the points you have mentioned in the post and are really helpful.